In his latest letter titled "Investing Without People", Oaktree's iconic founder and distressed investor Howard Marks becomes the latest to opine on the rise of index funds, the decline of human investors and how the advent of computer-driven trading is reducing the role of people in the markets while creating room for a select few money managers to excel. The bottom line is that the wisdom of investing passively depends, ironically, on some people investing actively. When active investing is dismissed totally and all active efforts cease, passive investing will become imprudent and opportunities for superior returns from active investing will reemerge. At least that’s the way I see it. Marks was also bullish on the need for humans even as machine learning advances in its ability to spot and execute trades. “Does passive and index investing distort stock prices?” This is an interesting question, answerable on several levels. The first level concerns the relative prices of the stocks in a capitalization-weighted index. People often ask whether inflows of capital into index funds cause the prices of the heaviest-weighted stocks in the index to rise relative to the rest. I think the answer is “no.” Suppose the market capitalizations of the stocks in a given index total $1 trillion. Suppose further that the capitalization of one popular stock in the index – perhaps one of the FAANGs – is $80 billion (8% of the total) and that of a smaller, less-adored one is $10 billion (1%). That means for every $100,000 in an index fund, $8,000 is in the former stock and $1,000 is in the latter. It further means that for every additional $100 that’s invested in the index, $8 will go into the former and $1 into the latter. Thus the buying in the two stocks occasioned by inflows shouldn’t alter their relative pricing, since it represents the same percentage of their respective capitalizations. But that’s not the end of the story. The second level of analysis concerns stocks that are part of the indices versus those that aren’t. Clearly with passive investing on the rise, more capital will flow into index constituents than into other stocks, and capital may flow out of the stocks that aren’t in indices in order to flow into those that are. It seems obvious that this can cause the stocks in the indices to appreciate relative to non-index stocks for reasons other than fundamental ones. The third level concerns stocks in smart-beta funds. The more a stock is held in non-index passive vehicles receiving inflows (ceteris paribus, or everything else being equal), the more likely it is to appreciate relative to one that’s not. And stocks like Amazon that are held in a large number of smart-beta funds of a variety of types are likely to appreciate relative to stocks that are held in none or just a few. What all the above means is that for a stock to be added to index or smart-beta funds is an artificial form of increased popularity, and it’s relative popularity that determines the relative prices of stocks in the short run. The large positions occupied by the top recent performers – with their swollen market caps – mean that as ETFs attract capital, they have to buy large amounts of these stocks, further fueling their rise. Thus, in the current up-cycle, over-weighted, liquid, large-cap stocks have benefitted from forced buying on the part of passive vehicles, which don’t have the option to refrain from buying a stock just because its overpriced. Like the tech stocks in 2000, this seeming perpetual-motion machine is unlikely to work forever. If funds ever flow out of equities and thus ETFs, what has been disproportionately bought will have to be disproportionately sold. It’s not clear where index funds and ETFs will find buyers for their over-weighted, highly appreciated holdings if they have to sell in a crunch. In this way, appreciation that was driven by passive buying is likely to eventually turn out to be rotational, not perpetual. The vast growth of ETFs and their popularity has coincided with the market rally that began roughly nine years ago. Thus we haven’t had a meaningful chance to see how they function on the downside. Might the inclusion and overweighting in ETFs of market darlings – a source of demand that may have driven up their prices – be a source of stronger-than-average selling pressure on the darlings during a retreat? Might it push down their prices more and cause investors to turn increasingly against them and against the ETFs that hold them? We won’t know until it happens, but it’s not hard to imagine the popularity that fueled the growth of ETFs in good times working to their disadvantage in bad times. Elsewhere, while complimenting algos which can handle more data, make fewer mistakes and never forget to rebalance but have their limits, pointing to the world's most successful quant hedge fund - Renaissance's Medallion - noting that even it has a cap on the amount of capital it can invest successfully, he notes that he doubts "computers can do what the very best investors do," bringing up such examples as sizing up the quality of a company’s chief executive officer, sift through venture capital pitches or tell which new building will attract the most tenants. Can they sit down with a CEO and figure out whether he’s the next Steve Jobs? Can they listen to a bunch of venture capital pitches and know which is the next Amazon? Can they look at several new buildings and tell which one will attract the most tenants? motivations other than economic maximization? "Computers, artificial intelligence and big data will help investors know more and make better quantitative decisions. But until computers have creativity, taste, discernment and judgment, I think there’ll be a role for investors with alpha." Leaving aside the question of whether a manager can add value by predicting the short-run direction of a market – about which I would be highly skeptical – I think one of these days, this investor may want to execute a trade that wouldn’t be doable in the “real” high yield bond market, and he’ll find that it can’t be done via ETFs either. In short, building a strategy around the assumption that ETFs can always be counted on to quickly get you into or out of an illiquid market at a fair price seems unrealistic to me. The truth on this will become clear when the tide goes out. Most people can’t and don’t beat the market, especially in markets that are more-efficient. On average, all portfolios’ returns are average before taking costs into account. Active management introduces considerations such as management fees; commissions and market impact associated with trading; and the human error that often leads investors to buy and sell more at the wrong time than at the right time. These all have negative implications for net results. The only aspect of active management with potential to offset the above negatives is alpha, or personal skill. However, relatively few people have much of it. For this reason, large numbers of active managers fail to beat the market and justify their fees. This isn’t just my conclusion: if it weren’t so, capital wouldn’t be flowing from active funds to passive funds as it has been. Regardless, for decades active managers have charged fees as if they earned them. Thus the profitability of many parts of the active investment management industry has been without reference to whether it added value for clients. Marks notes that it is important to note that the trend toward passive investing hasn’t occurred because the returns there have been great. 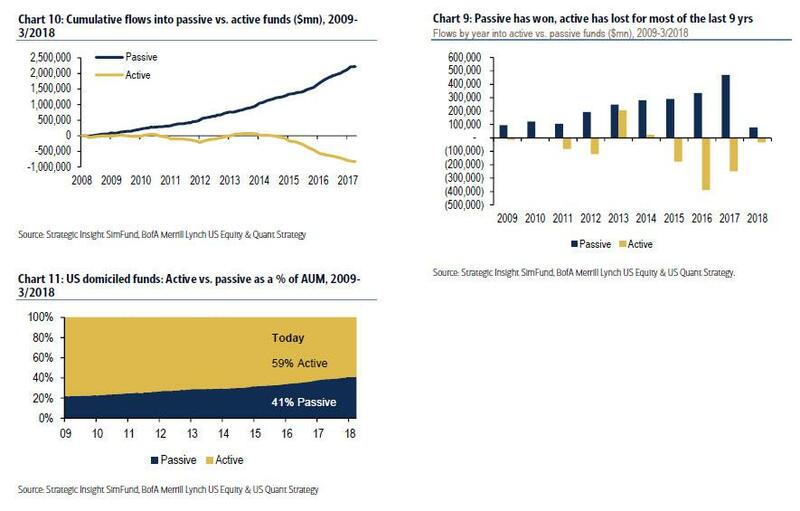 "It’s because the results from active management have been poor, or at least not good enough to justify the fees charged" but "Now clients have wised up, and unless something changes with regard to the above, the trend toward passive investing is going to continue. What could arrest it?" More active managers could become capable of delivering alpha (but that’s not likely). The markets could become easier to beat (that’ll probably happen from time to time). Fees could come down so that they’re competitive with passive investment fees (but in that case it’s not clear how the active management infrastructure would be supported). Unless there are flaws in the above reasoning, the trend toward passive investing is likely to continue. At the very least, it reduces or eliminates management fees, trading costs, overtrading and human error: not a bad combination. Of course, there are active investors who outperform. Not most, and not half. But there’s a minority who do earn their fees, and they should continue to be in demand. Finally, I view this situation kind of like index investing: if the day comes when intelligent machines run all the money, won’t they all (a) see everything the same, (b) reach the same conclusions, (c) design the same portfolio, and thus (d) perform the same? What, then, will be the route to superior performance? Humans with superior insight. At least that’s my hope. It's also the hope of every human trader reading this as the alternative is extinction.